Because of it's versatility and beauty this necklace has been one of our all time best sellers! There are five possible ways to wear this piece as you can see illustrated in the image to the left. 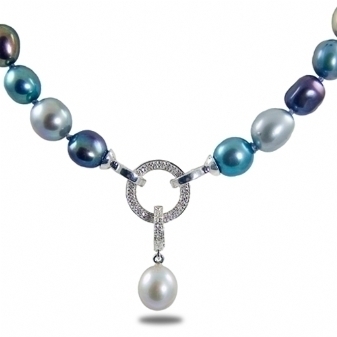 The pearls are Freshwater 9-10.5mm and vary in vibrant colors in the blue to grey family. The interchangeable clasp/enhancer sterling silver with genuine diamond accents. The overall length of the necklace is 18"